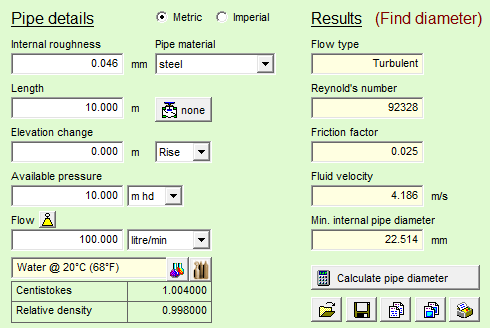 Pipe Flow Wizard is our amazingly easy-to-use software utility for calculating flow rate in a pipe, calculating pressure drop in a pipe and sizing a pipe diameter. It calculates results for a single length of pipe between a start elevation and an end elevation, allowing for the addition of pipe fittings to represents valves and bends along the pipe. Do you need to size pipe diameters? Buy Pipe Flow Wizard Software & get licensed in less than 2 minutes. Pipe Flow Wizard comes with its own Pipe Database, its own Fittings database, and its own Fluids Database. With users in over 100 countries worldwide, you know that Pipe Flow Wizard is an extremely useful flow rate and pipe pressure drop calculator. When a pipe's flow rate, internal roughness, internal diameter, length, fittings and elevation change are known the PRESSURE DROP through the pipe can be calculated. The Pipe Flow Wizard Software calculates pressure drop in the pipe due to friction loss, fitting loss and change in elevation. 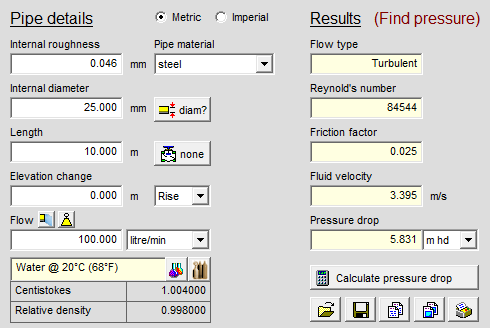 As part of the pipe pressure loss results it also calculates and displays the type of flow (laminar flow or turbulent flow), Reynold's number, friction factor and fluid velocity. When the available pressure, internal roughness, internal diameter, length, fittings and elevation change are known the FLOW RATE through the pipe can be calculated. The Pipe Flow Wizard Software calculates the flow rate in the pipe that will occur for the given pressure conditions and the pipe size and length specifications. 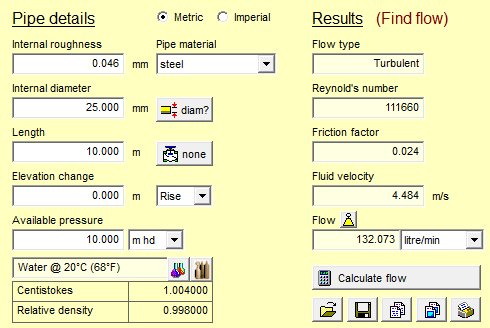 The type of fluid flow (laminar flow or turbulent flow), Reynold's number, friction factor and fluid velocity are also calculated and displayed. When the pressure in the pipe, flow rate, internal roughness, length, fittings and elevation change are known the MINIMUM INTERNAL DIAMETER of the pipe can be calculated. The Pipe Flow Wizard Software calculates the minimum size for the internal pipe diameter that will allow the specified flow rate for the given pressure conditions and length of pipe. It also calculates whether laminar flow or turbulent flow occurs, and shows the Reynold's number, friction factor and fluid velocity. When internal roughness, internal diameter, fittings, elevation change, available pressure, and flow rate through a pipe are known the MAXIMUM LENGTH of the pipe can be calculated. 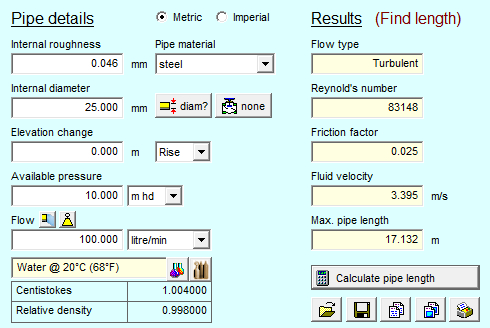 The Pipe Flow Wizard Software calculates the maximum pipe length for which the given flow and pressure conditions can be met with current pipe material and pipe size. The software also identifies if laminar flow or turbulent flow will occur and displays the Reynold's number, friction factor and fluid velocity. Would instant and accurate flow rate and pressure loss calculations help you save time and effort? Piping engineers from all over the world choose our Pipe Flow Wizard software when they need a simple utility program that takes the pressure out of performing fluid flow calculations on a single length of pipe.